Is Sunlight Good For Your Pond Fish? 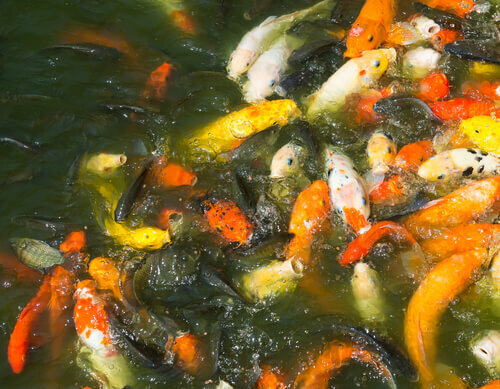 Home > Blog > Fish Care > Is Sunlight Good For Your Pond Fish? Many new pond owners are concerned about the effects of sunlight for pond fish. This is an important issue, and the solution will depend on various factors. Sunlight can be beneficial to your fish, but it can also harm them, and the outcome largely depends on the pond’s construction, location and how it is maintained. When a pond is directly exposed to sunlight without shade the temperature of the water will increase. This increase in temperature will lower the amount of oxygen which is accessible to the fish, while also promoting the growth of algae. Fish which are exposed to excessive sunlight may also receive sunburn. Each pond is unique in the manner in which it will respond to the sun, and while ponds which are big and deep may not have much of an issue, the smaller ponds which are typically found in backyards may be adversely impacted. Algae enjoy sunlight and will thrive when exposed to it. If your pond contains koi they should be exposed to no more than a few hours of sunlight per day. Anything more than this could be problematic for them. The typical pond will receive between four and six hours of sunlight per day. The best way to manage your pond’s exposure to sunlight is by adding shade. Terrestrial shade can be created by adding marginal plants or trees near the side of your pond. However, during fall leaves will fall from the tree and will cause serious problems if they are allowed to accumulate in the water, so you will need to perform netting or clean them out. Dwarf Cattail which is planted on the west or south side of the pond will provide excellent shade for the fish. Aquatic plants can also be used to manage sunlight, and some of the best include water hyacinth or water lilies, which create shade beneath the water that can be used by your fish. The lilies can be planted via plant bags and or baskets and situated in advantageous locations throughout the pond. An alternative to the planting of trees could be a canopy or manmade structure which will cast shade over the pond. The right canopy can also add style to the area. Perhaps the easiest solution is fish shelters or caves. The shelters can be placed in the water and will allow the fish to swim beneath or within to get shade whenever they need it, while caves will also perform the same function, although constructing them may be more complex. In addition to protection from sunlight, these structures will also protect your fish from predators. Just as too much sunlight is bad for fish, too much shade is equally so. The most ideal ponds are those which have some areas reserved for sunlight, while others which are reserved for shade. This will give the pond a balanced temperature which will make your fish healthy and happy.